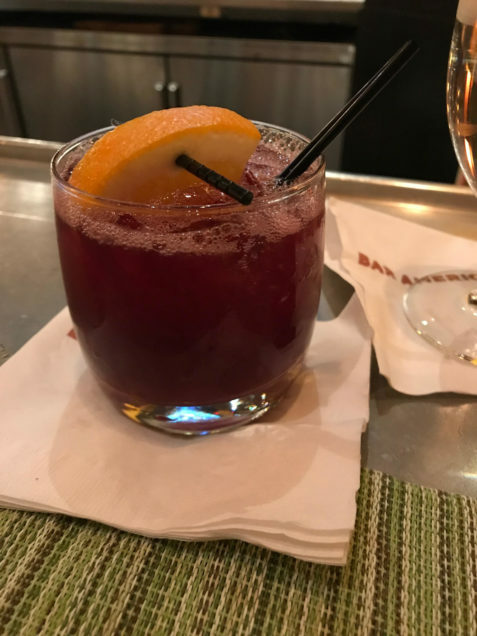 Uncasville, CT. Bobby Flay’s Bar Americain at Mohegan Sun. Because my actual worst vice is gambling, the next step was to strong-arm my Boston-area pal to accompany me on an overnight visit to Connecticut’s two super casinos, Foxwoods and Mohegan Sun. The latter joint had the better, well, everything, including bars. Bobby Flay’s not so Casablanca like Bar American has decent food and drink, though the cocktails seem to be slightly less than the sum of their parts. Still, I give them credit for trying some stuff. Their version of sangria contains a high-end Spanish wine, Vina Bujanda Tempranillo, plus Michter’s Rye, with some simple syrup and bitters, I was hoping for better, but it was perfection itself next to the two truly crappy drinks I had at the Guy Fieri place at Foxwoods. On the other hand, I won at craps at both casinos. Like Drink in Boston in the last post, the Eddy was another bar that seemed to be at or near the top of all the lists, and it became my first choice destination. However, circumstances seemed to be against me, and I was actually heading to another bar when I saw I that I somehow was passing Eddy Street. Sure enough, the bar was right around the corner and I was the first one in for the 4 p.m. opening. The good press wasn’t wrong. The Eddy is a place that clearly puts some love into their drinks, and you have to respect that. The Flippy-Ki-Yay, immediately attracted my attention. It contains both stout and a whole egg, making it a sort of double flip since, while most flips feature a whole egg, others use various types of dark beer. The ultra-fiip was as sweet as you might expect but also with lots of bitter and robust, almost cappuccino-like, flavors. A very nice drink for a cold autumn day. For the record, aside from the beer and the chicken ovum, it contained David Nicholson Bourbon, Averna (an amaro), Bittermens Buckspice Ginger, and smoked salt. I had a very nice time chatting with some of the folks at the Eddy and was thinking I was very lucky to be there. As I was just about to leave, a guy in a baseball hat who I didn’t recognize at all said he recognized me, though he wasn’t quite sure where he knew me from. He turned out to be Dan, my outstanding bartender from Boston’s Ward 8 bar, which I celebrated in the prior post. Given that Boston and Providence are about 55 miles apart, it was quite a coincidence. I suppose Dan and I were driven together by a love of fine cocktails. Cambridge, MA. Miracle of Science Bar & Grill. And, as if by magic, it was Saturday night and I was once again in the Boston area. 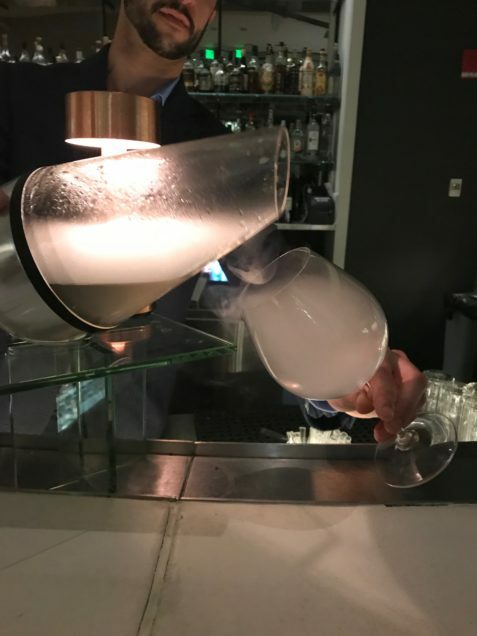 The Miracle of Science is at a restaurant that takes it’s proximity to MIT seriously. They practice some degree of what’s called molecular gastronomy, and it has a menu that’s an homage to the periodic table of the elements. How could any cocktail geek resist? The bar for boozed-out science geeks definitely produced the most photogenic drinks of the trip. Well, technically the first drink wasn’t a drink at all. It was a Pina Colada in the form of a gas. 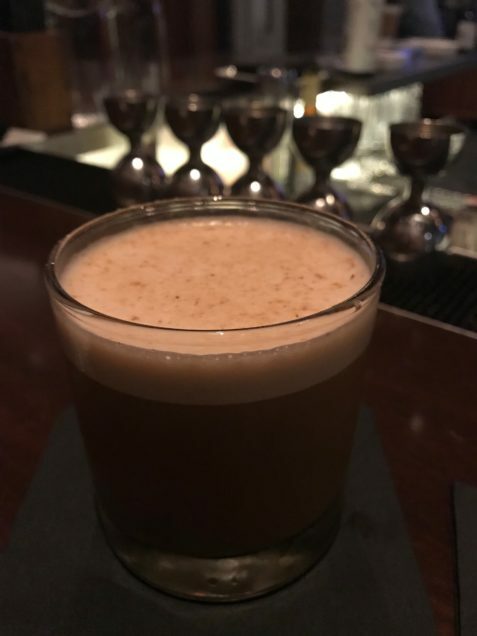 I’m not sure how much of a buzz you can actually get from it, but it really does taste exactly like that 1970s favorite that Rupert Holmes sang about, only lighter and — as the bartender pointed out –a lot less fattening. 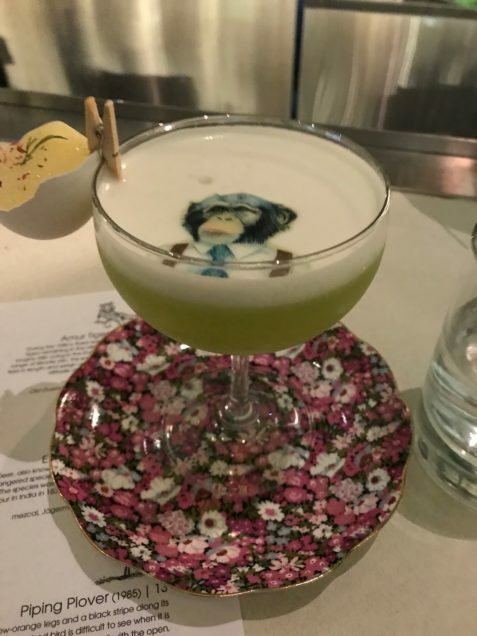 Still I needed more substantial fortification, so next I opted for the Titi Monkey, a spin on a Pisco Sour that pays tribute to a primate native to Peru and Colombia. To the usual pisco, lemon juice, sugar, and egg white, the drink adds matcha sandalwood. Much as another old SNL skit offered us a product that was both a floor wax and desert topping, this product appears to be both a cocktail flavoring and an exfoliant skin scrub. Finally, it was just a matter of hours before I’d have to awake at 4:00 a.m. to catch my early flight back to L.A, Me and my MA host found ourselves once again in Cambridge in a combination speakeasy and old school arcade with an unpronounceable name that I’m sure has some kind of story behind it. It’s a large space mostly filled with 1970’s pinball machines facing off against late 1980’s video games. Indeed, the place could be a sort of Valhalla for a lot of guys around my age if it weren’t for the loud, loud, loud “old dudes stay away” music that was blaring at us. 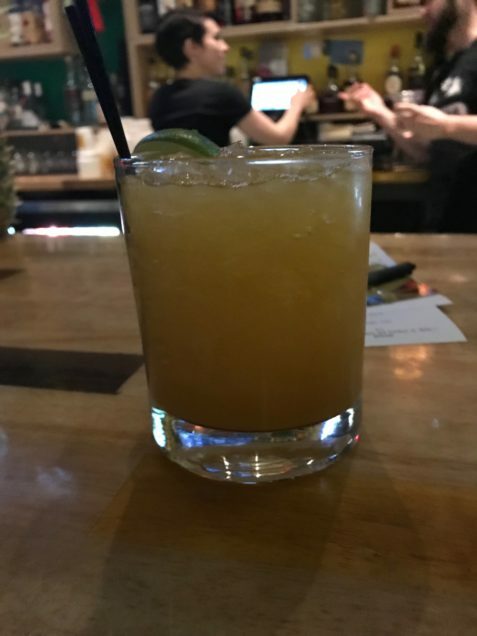 Fortunately, it was a might quieter at the bar, just quiet enough to make order, which is good because the drinks here are a lot better than they probably have to be. These are beverages that feed that New England desire for sweetness but in a way that had enough real fresh fruit juice flavor to be delightful, while it was still boozy enough to be taken seriously. It was so good that I didn’t even notice that I, once again, I had two more tiki drinks in front of me. I just couldn’t resist the names. The green monster above is named “Land Shark” after the classic early SNL “Jaws” riff. It contains something called Privateer Tiki Gin, Angostura 7 Year Old Rum, Cognac, sherry, and passion fruit. Don’t ask me how it got that color, but it’s very tasty. 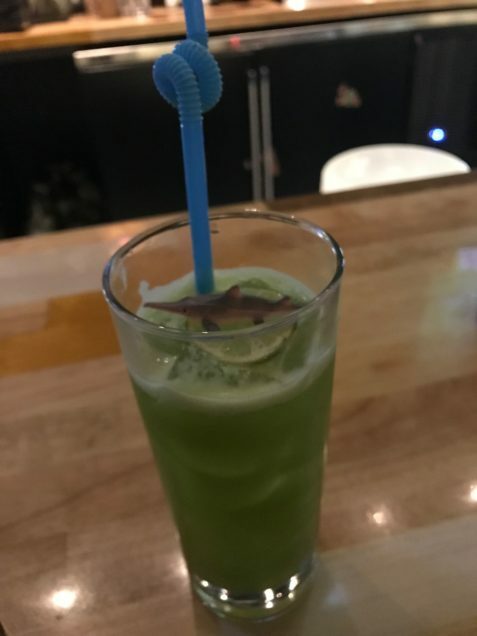 Just as good, less photogenic, but even more enjoyably named, the Upside Down pays tribute to everyone’s favorite tale about misfit pubescent boys and a girl facing off against the forces of evil that isn’t “IT.” The stranger things in this tasty cooler include Santa Teresa 1796 Solera Rum, mango, falernum (think vanilla Christmas in a bottle), something I assume is creme de cacao, and lime juice. “What about Barb?” the menu asks. Well, it didn’t make up for the high schooler’s shabby treatment, or the fact that a really fun and educational trip was at an end, but it was a pretty nice way to wrap my booze odyssey.